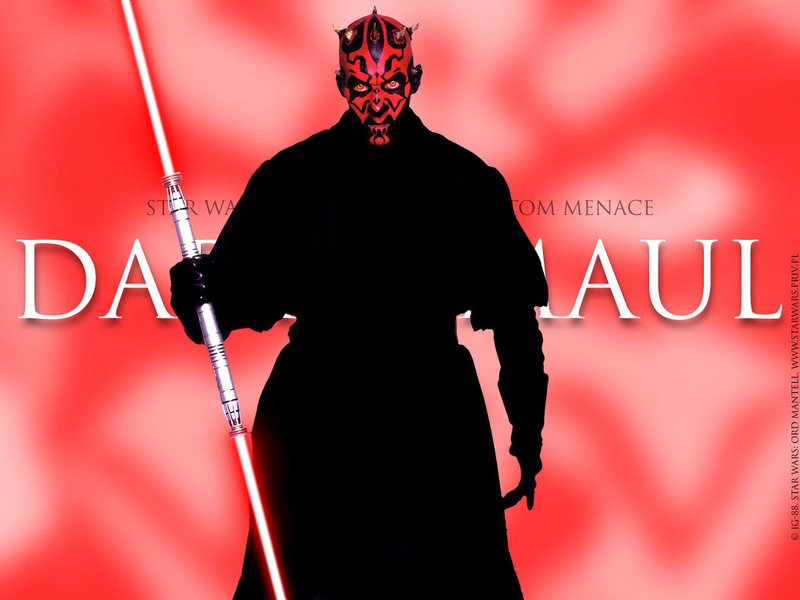 As mentioned last week, I am working on a Darth Maul project, and with Star Wars, Episode I (“The Phantom Menace”) being the first time that we see Darth Maul, this is the first post in the series. This appearance is the only one for him in any of the movies and, for many people, the only time he appears. He appears alongside Lord Sidious as his apprentice, scaring the Trade Federation leaders, concerned that they are now not only involved with Lord Sidious, but now his apprentice, as well. Although we only see him in a hologram communication for his initial appearance, he does seem intimidating and mysterious in his cloak. But it’s also the surprisingly ominous way in which he is introduced that also is interesting (Lord Sidious: “This is my apprentice, Darth Maul. He will find your lost ship.”). We then see Lord Sidious and Darth Maul walking together on Coruscant (Darth Maul to Sidious: “At last, we will have the chance to reveal ourselves to the Jedi. At last, we will have revenge.” Sidious in response: “You have been well-trained, my young apprentice. They will be no match for you.” ). Each of these statements have so much to unpack: 1) Lord Sidious has a great amount of confidence in Darth Maul, in his abilities, etc., 2) Sidious believes that Darth Maul will easily be able to take the Jedi (and he was very close to being correct), 3) If Darth Maul has been so well-trained, that means that Lord Sidious has spent a great amount of time and energy training him – how long?, 4) With Darth Maul’s statement, why is he so excited to reveal themselves to the Jedi? It’s fascinating to experience the disbelief from Masters Ki-Adi-Mundi and Mace Windu, since the Sith haven’t been around, yet Yoda is wise enough to know that it is a legit possibility. 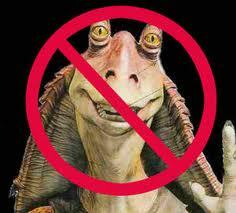 Fortunately, Master Windu (and the council) are quite curious in finding out more about this attacker. We then see Darth Maul with the Trade Federation leaders on Naboo, although it’s unclear what role he had with them: was he there as security for them? was he there to keep them in line – to keep a close, watchful eye on them? was he there as an advisor? was there another possibility? Then he comes out and fights Qui-Gon Jinn and Obi-Wan Kenobi on Naboo. (This is also exciting, since it’s the first time we hear “Duel of the Fates“, which is a really great song!) We see that not only does he have a light saber, but that it has two blades! That he can easily wield such a weapon speaks a lot about his abilities. Also, he removes his cloak and seems especially scary – yes, he’s got a red and black face, which is scary enough, however, his head horns also make him seem more dangerous and scary! In his fighting with them, he is definitely holding his ground and quite able. Eventually, he gets into a one-to-one situation with Qui-Gon Jinn and runs him through with his light saber, killing him (although he seems pretty arrogant in that he immediately turns his back to Qui-Gon Jinn, as if he is no longer a threat (which seems strange, since his light saber is still there and he’s not quite dead yet), although Qui-Gon Jinn doesn’t do anything). Then, Obi-Wan Kenobi comes running after him, furiously (there’s so much there to unpack about Obi-Wan Kenobi and his anger in this scene – how does that channel to his future padawan, Anakin? ), with an exciting light saber battle between just Obi-Wan Kenobi and Darth Maul. Despite Obi-Wan Kenobi’s furious fighting, Darth Maul is able to hold him off. Eventually, Darth Maul uses some impressive force power to send Obi-Wan Kenobi flying back and off of the platform into the shaft, although Kenobi is able to grab onto something, so that he doesn’t fall down it. However, Kenobi eventually uses the Force to ascend and seize Master Jinn’s light saber, and slicing Darth Maul in half, sending him down the shaft. This seems to be the end of Darth Maul…. 1) Mace Windu acknowledges that, indeed, this mysterious warrior was Sith, 2) Yoda tells us that Sith operate in pairs – master and apprentice, which results in the great question: 3) was Darth Maul the master or the apprentice: if the former, then they just have to root out the apprentice; if the latter, that’s pretty scary for the Jedi, since if he’s that powerful, how powerful must the master be? He is scary-looking – from the very first time we lay eyes on him, he is imposing, scary, dark and mysterious. Whether its the scowling face, the red-and-black face, the sharp teeth, or the horns on his head, he does not look like a pleasant being. He has had a lot of training – so much so that Lord Sidious is very confident in his abilities to defeat the Jedi. We also see him use the Force to shove Obi-Wan Kenobi tumbling. He is a great fighter – with not only taking on Qui-Gon Jinn and Obi-Wan Kenobi simultaneously, but killing Qui-Gon Jinn and nearly killing Obi-Wan Kenobi, he shows that he is, indeed a well-trained fighter. He is very physically-talented – not only does he wield a double-bladed light saber, which requires a certain amount of strength, but he is also able to jump and move easily when fighting the Jedi on Naboo. He seems to die – he gets sliced in half by Obi-Wan Kenobi.